Since everyone has their own preferences and memories for the perfect board game, it is difficult to say which is the absolute best. Do you go with a classic board game or something cutting-edge? Should it be the most popular or the most scary? For this list, the top spot goes to one with overall great reviews and an important focus that other board game options tend to lack: a great story line. 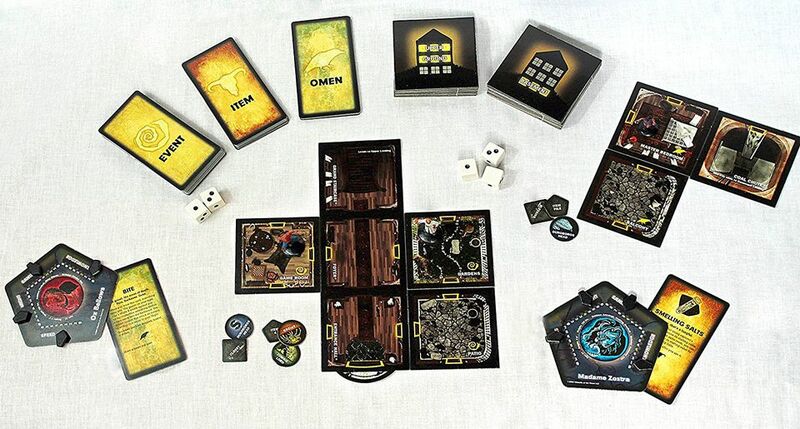 Betrayal At House On The Hill is all about discovering the secrets behind the House on the Hill. Players explore tiles and perform haunts where one person secretly attempts to betray everyone else. A great mix of mystery and horror with a dash of old-school detective work, this board game manages to create a feeling of suspense that lasts for hours. Good for three to six players ages 12 and up, the game will have you questioning your own circumstances as you move through the always-fresh story each time you play it. Board games aren't the most expensive way to have fun, especially if you compare the typical price of a movie ticket or videogame. Still, if you're looking to save a few bucks without digging into a garage-sale bin, there are plenty of options out there. Taking the top spot with a budget-friendly focus, this next game promises hours of fun with a few extra dollars in your pocket. Good for young children as well as the occasional adult, Family Pastimes’ Secret Door is geared towards teaching its players the benefits of cooperation and teamwork in addition to providing a great time. Having to overcome challenge and puzzles around the board to find the secret door, this game forces each player to cooperate: creating strategies, discussing ideas, and developing an overall game plan to win the game as a whole instead of individually. Reviewers note that the memory aspects plus the fast pace make this game ideal for a variety of players, including kids on the autism spectrum. Escape rooms have become a popular craze all over the world. Stuffing several people inside a single room and locking it from the outside creates the perfect setup for an hour of entertainment and problem-solving. Encouraging people to solve a variety of puzzles also is a great way to promote teamwork and group cohesion. Bringing all the fun of an escape room to the home without the unnecessary and costly setup, ThinkFun’s Escape The Room: Stargazers Manor replicates the same feel and excitement you can experience with the real thing. Best of all, this game is all about cooperation as well. While you have a competitive drive to win, you can’t do so all alone. The combination of teamwork, a great easy-to-follow story and decent challenges to solve make this a great all-around game to consider the next time you're looking for something to play to pass the time. Sometimes, the mystery genre can be too complicated or advanced for younger children. To start off small, this next pick is a great mystery board game that is focused on cooperation instead of competitive gameplay. It combines great deduction education with a fun storyline that all ages will enjoy. Asmodee Mysterium Game relies on some of the most common mystery tropes to drive its story. One player acts as a ghost, trying to reveal clues to others about his murder. Others have to solve the mysterious crime that has been committed. The catch? Everyone else is a psychic investigator with a few extra powers to help you out. Doing a good job of balancing fresh narrative elements with classic board game mystery play, this game will have you thinking about the nuances of the storyline more than anything else. This game is an Amazon's Choice listing because more than 85 percent of its reviews land at four or five stars. Want to take a look at some other options? See our guide to the best board games for kids. There's nothing quite like a classic board game. Regardless of the genre, the board games most people remember growing up playing are still around in one form or another today. This means a large number of people are already familiar with the rules and know what to expect — perhaps even how to win. If you want to add a mystery board game that comes from this classic period, there's no better option than a good game of Clue. This game still offers a perfect option for having a great Friday night with family and friends. Best of all, since it is so well-known to most people, you won’t have to spend as much time getting everyone up to speed on the rules and gameplay. Choose a piece, set up the board, and you're on your way to figuring out who did it once again. Putting together clues, analyzing a scene for evidence, and connecting all the dots has many practical benefits as well as the ingredients for a great time. We use deductive reasoning every day of our lives, so any way to sharpen these skills, particularly for younger children, shouldn't be overlooked. Ravensburger’s Scotland Yard is all about hunting down Mr. X in London. Each round, Mr. X makes the first move to leave clues for others to find. Unlike other mystery and crime-solving games, however, this one forces you to pay attention to the subtle details that often go unnoticed. As a result, the game will have the side benefit of improving your deduction and observation skills, making you as close to a real Sherlock Holmes in no time as possible. This game is best for four or more players aged 8 or older. Reviewers praise the mechanics of the game, saying that playing as Mr. X is almost as fun as trying to catch him. Some board games eventually grow stale with repeated plays. After you have played through the storyline or have beaten up the family time and time again, it loses the excitement and thrill it offered upon first play — unless you have a board game that has been designed to create adventure after adventure with the same level of fresh excitement each and every time. Set in Victorian England, the Deluxe Baker Street Game is like a buffet of mystery and crime cases to solve wrapped up in a single boardgame. Players move around London solving various cases. Good for two to six players, this is one game you don't need a large crowd to keep going for hours. Best of all, players down to the age of 12 can enjoy and participate in the game without feeling lost. Start over time and time again for a new adventure or add new players to change the dynamics of the game itself.